You’re always looking for ways you can improve the customer experience and grow your business in the process. But lately, you’ve been wondering if your call center is doing your company more harm than good. You want to understand how the latest technology can improve things. In this post, we’ll tell you everything you need to know about five of the biggest call center technology trends. From understanding what A.I. 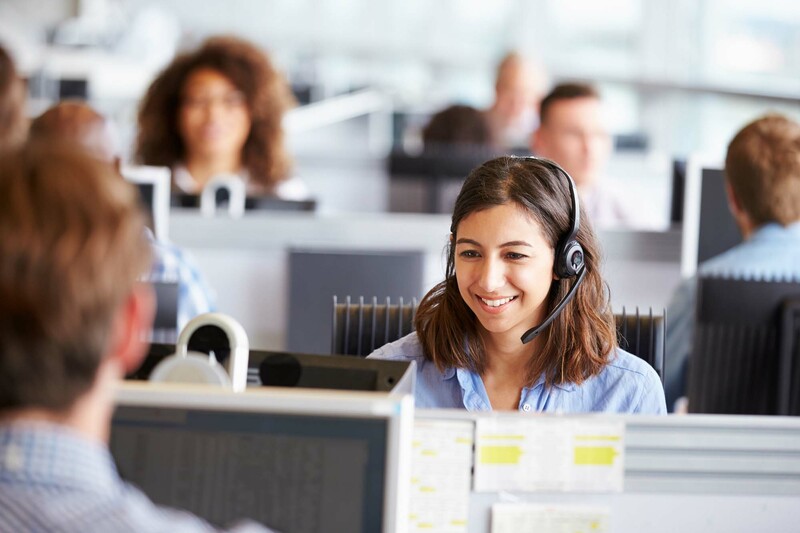 can do to improve the customer experience to outsourcing your call center, read on to learn what you can be doing better. It’s no secret that standard Interactive Voice Response technology has left customers feeling frustrated. No one wants to have to sit through countless automated options, only to be directed to the wrong place. The rise of predictive A.I. call center technologies is looking to change all of that. This technology can actually recognize and respond to words/phrases and tone of voice. A.I. also uses past consumer data and order history to improve call center customer services. This allows customers to be directed to live agents (more on that later) who are the most qualified to handle their problems and questions — faster than ever before. Whether you’re interested in improving your small business call center, or if you need a call center that can handle thousands of customers, one thing is certain. Your clients need omnichannel communication. They need consistent contact, whether they’re using their cellphone, office telephone, desktop computer, or even another mobile device. The goal is for agents to be able to see call and customer history (as well as notes from other agents) across all devices. This means that your clients won’t have to repeat the problems they’re having to several different agents. This leads to increased customer satisfaction, shorter resolution times, and a stronger reputation for your brand. You understand how important lead generation is when it comes to growth. However, with everything else you have to do in a day, the truth is that sometimes, it just falls through the cracks. What if your call center did more than just provide customer service? What if your call center could not only reach out to new leads but also follow up with clients you’ve done business with in the past? Now is the time to learn more about pay per call leads, and how they can help to grow your business. Live agents will be able to speak to these leads and make follow-up calls — even when your sales team isn’t able to. They can get to know the needs and pain points of these clients, and then pass that information on to you. This way, when a sales representative meets with these prospects in person or reaches out to them over the phone, they’ll be armed with serious knowledge about exactly what the potential customer is looking for. This means they’ll be much more likely to actually close the deal. We know you’re always looking for ways to get to know your customers on a deeper level. Sending out online surveys or combing through customer reviews on third-party websites are two effective tactics. But the truth is that it can be tough to incentivize customers to leave reviews or rate your company after the transaction has been completed. How can you learn what you’re doing right — and wrong? By using call center technology that allows you to guide your customers through an automated survey at the end of every call. They can rate the service using buttons on their phone. They can even record short messages to give you more personalized feedback. This way, you’ll know if you need to follow up with a client. It also helps you to recognize customer patterns, identify talent at your company, and much more. A shocking 85% of projects go above budget in some capacity. This means that your business, regardless of size or industry, may not currently be able to afford to hire a new employee or even an in-house call center team. For many companies, it’s the convenience and low cost of remote call centers. First of all, this allows your customers to speak with a live agent — at any time of the day or night. This means your customers won’t be limited to your operating hours when they have a question or emergency. Additionally, remote agents are trained to respond to common customer scenarios. Often, they can resolve these issues without ever having to contact you. If there’s a problem they can’t solve, they can use call forwarding to send the caller directly to you. If you’re looking for a way to lower your overhead and improve customer service in the process? Don’t discount the advantages a remote calling center has to offer your business. You already outsource countless other parts of your business. Make your call center the next thing on that list. Whether you want to look into remote call centers, or if you’re curious to learn more about omnichannel communication, we hope you use these call center technology trends to grow your business. There’s no reason for you to have to deal with decreased customer satisfaction, missed opportunities, or a lack of feedback when the right call center can offer you all of that and more. Looking to learn more about the latest tech trends? Want to understand how the right digital tools and software can streamline your business? We’ve got you covered! Check out some of our other blogs for some great info!